My apologies to David Rosengarten, author of the “Dean & Deluca Cookbook,” for taking liberties with his luscious recipe, starting with the soft shells instead of hard-shell crustaceans. I deep-fried them rather than stir-fried them in chunks in their shells, and I doubled the sauce recipe. 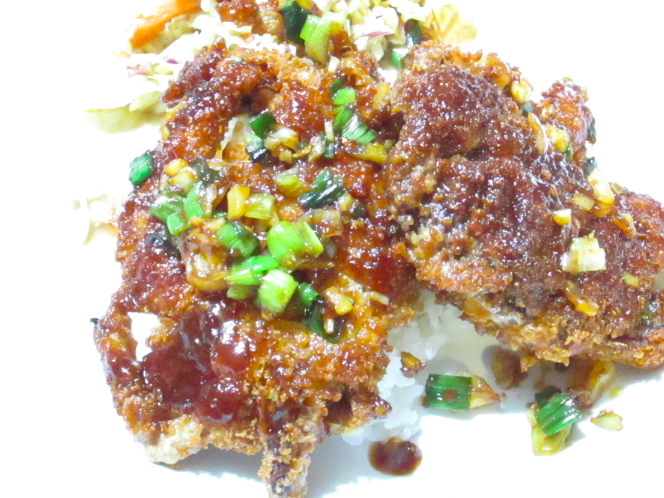 I re-warmed the crispy-crunchy crabs in the sauce and served them over mounds of steamed rice. The crabs were glorious. The spicy-sweet sauce is actually more of a glaze. I’m glad I made a double batch, because it was just enough for the six crabs I cooked. My version makes a mildly spicy dish. (I gauge heat by whether I let the dog have a bite, and in this case I did). If you prefer more heat, add one or two more Szechuan chili peppers. As part of a Chinese dinner with other dishes, one crab per person is plenty. If serving the crabs alone, as I did, three per person is about right. Tony loved this meal. I think there are more soft-shell crabs in my future. Combine all sauce ingredients and mix well. Drain thoroughly, then place between paper towels and gently but firmly press out as much moisture as possible. Set aside. Line up three shallow bowls near the stove. Place flour in one bowl and crumbs in another. In the third, beat the eggs with two tablespoons water. Heat 1 1/2 to 2 inches of vegetable oil in a wide, deep pan or deep fryer. When the temperature reaches 375 degrees, begin breading crabs: dip each one in flour, shaking off excess, then dip in egg mixture, then coat completely with crumbs. In batches if necessary, fry in hot oil for about three minutes or until a deep golden brown, turning once with tongs. Drain on paper towels. Heat a large skillet over high heat until hot. Add vegetable oil and heat. Reduce heat to medium. Stir fry ginger, garlic, green onions and dried chili for about one minute. Add half of the Szechuan sauce and stir well. Warm three of the crabs in the sauce, turning to coat both sides. Remove to dinner plates or a platter. Stir remaining sauce into skillet and repeat with remaining crabs. Serve over small mounds of rice, drizzled with remaining sauce in skillet. Remove the dried chili peppers before eating. Makes two servings (or six as part of a larger Chinese meal). You’ll never have to eat noodles alone again with the Anti-Loneliness Ramen Bowl. My friend, Cindy, forwarded a link to this bizarre product, which is basically a bowl with a smartphone holder. Check it out at http://www.misosoupdesign.com. Then tell me whether you’d mind chatting with someone who was slurping noodles. If you can’t find frozen soft-shell crabs in your local supermarket, try a seafood store such as Klein’s in Akron or BayLobsters in Twinsburg. They are usually packaged in individual cellophane sleeves. Soft shells are Atlantic blue crabs that have shed their shells and are caught before their new shells harden. The entire thing is edible, so no cleaning is required. When thawed, the crab should smell sweet, with a faint salt whiff of the sea. It seems your slow cooker chicken paprikas recipe is missing! Wash chicken pieces and trim off excess skin. Rub all over with salt, pepper and paprika. Place in crockery cooker. Scatter onion over chicken. Pour in chicken broth. Cover tightly and cook on high setting for 30 minutes. Turn to low setting and continue cooking for 6 to 7 hours, or until chicken is tender. Just before serving, stir in sour cream. Makes 6 servings. Hi Jane. Wolfgang Puck Versa Cooker is a slow cooker that is not your mother’s slow cooker. You can braise in it as well as slow cook; it saves steps and pans. Dear Dennis: I hadn’t heard of this new version. I’ll put it on my birthday list. You mentioned stuffed pepper soup in your last email. Do you have a recipe for stuffed pepper soup made in a slow cooker? How can you figure out how many servings you get in a 4- or 6-quart cooker? Our church is having a “souper” bowl luncheon and I need to know how much soup a 4- or 6-quart cooker makes. Dear Joan: One cup is generally considered a serving of soup. So if you fill your 4-quart cooker, that would be 16 servings. A 6-quart cooker would hold 24 servings. Subtract a couple of cups if the soup doesn’t fill the cooker all the way to the top. Use a regular soup recipe, browning the the ground beef and aromatics (onions, garlic, etc.) in a skillet before transferring to the slow cooker and adding the remaining ingredients. You could brown the stuff in the cooker on high power, but using a skillet is quicker. Liquid doesn’t evaporate in a slow cooker, so add it after the other ingredients, using just enough to produce the ratio of solids to liquids that you prefer. Here’s my stovetop version of stuffed pepper soup. In the winter I use frozen whole tomatoes from my garden instead of canned tomatoes, and roasted frozen green and hot peppers. Heat a soup kettle over medium-high heat. Add olive oil and when it begins to shimmer, add peppers and cook, covered, until peppers are limp, stirring often. Remove from pan with tongs and set aside. In same pan, adding more oil if needed, sauté onions and garlic for 1 minute. Add ground beef and cook until no longer pink. Drain off most of the grease and season beef with salt, pepper and chili powder. Return peppers to pan. Stir in beef broth and tomatoes and their juice, breaking up tomatoes with a spoon. Bring to a boil, reduce heat and simmer, covered, for about 30 minutes or until flavors are blended. Add more salt and pepper if needed. Stir in rice and continue to cook, covered, for about 20 minutes or until rice is done. Makes about 8 servings. 2) Use canned beans (I know, I know…). 3) Invest in a pressure cooker – it makes short work of dried beans (of course, the investment in a pressure cooker wipes out the savings of using cheap dried beans!). 4) Cooks Illustrated/America’s Test Kitchen actually suggests using salted water (a brine) to soak your beans. According to the food scientists, the sodium ions in the water are exchanged for calcium ions in the beans’ skins, which makes them more tender. For one pound of beans, dissolve 3 tablespoons of table salt in 4 cups of water. Soak the beans for at least 8 and up to 24 hours. Discard brine, rinse beans, and proceed with recipe. I tried this once and the beans did have a wonderful, creamy texture but I found them very salty (and I like salt). Dear Rob: Thanks for seconding my hunch, that the beans were probably hard because they were old and uber-dry. Also, I appreciate the info on salting beans, an about-face from the accepted lore of years past. ”gamey” flavor. Hope you like it! until the onions are golden. Add remaining ingredients and simmer for one hour. Strain and cool. 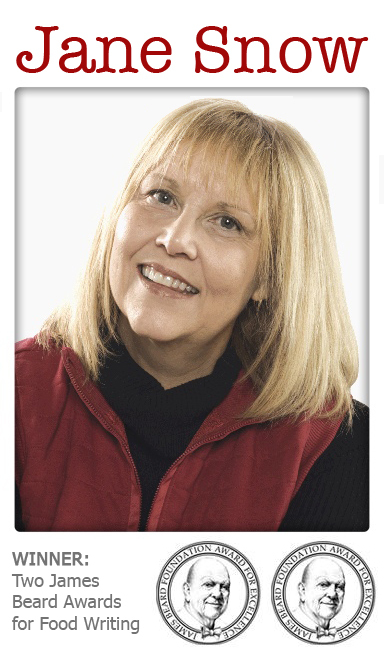 Dear Peggy: Nice to know there are other venison cooks out there. I am The Environmentally Friendly Knife Sharpener. We met several years ago when the Countryside Conservancy Farmers Market was at Stan Hywet Hall. I haven’t seen you in a while and would like to make you aware that Countryside has markets all year long. Countryside meets twice a month at Old Trail School in Bath. The next market will be from 9 a.m. to noon Feb. 9, and then Feb. 23 , March 9 and 23, and April 6 and 27. Here is a link to the Countryside website. If you get the chance to come out, it will be nice to see you. We normally have between 40 and 50 vendors depending on weather — greens, lettuces, meats, baked goods, coffees and teas, even prepared foods. Dear Kevin: And knife sharpening! Thanks for reminding me (and all of us) of the winter markets. I’ve been hibernating and need to get out. Hope to see you soon. Mrs. Millers’ Homemade Noodles (www.mrsmillersnoodles.com), which produces homemade noodles right in Fredericksburg, sells “Old Fashioned Large Pot Pie Squares.” While I’ve never tasted that variety of noodle, her other varieties are wonderful! Esther Miller started making the noodles in her home and now produces them commercially in Fredericksburg along with her family. While I don’t know what stores carry which varieties, I buy her noodles at Buehler’s Markets. I believe that Giant Eagle and Fisher Foods may also carry her noodles. This may be the product Barbara purchased at Troyers. Dear Robin: How interesting! I love to hear about local products like this. Regarding produce stores, I much prefer Shaffer’s down the street from Figaro Farms in Uniontown. Dear Bridget: I forgot about that one. Thanks.